We may have over-indulged in libations on Saturday night. And that only means one thing around here the next morning. A big breakfast. My hubby is obsessed with eggs benedict. I am obsessed with ALL THINGS caprese. 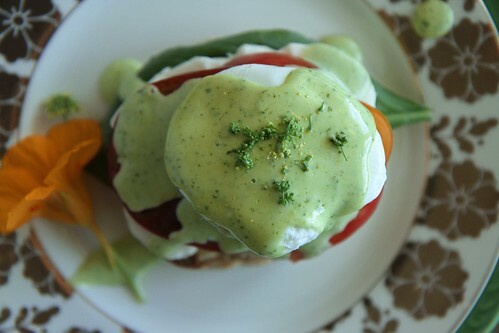 So Sunday morning I whipped up a batch of summery Caprese Benedict with Basil Hollandaise to get the best of both worlds. 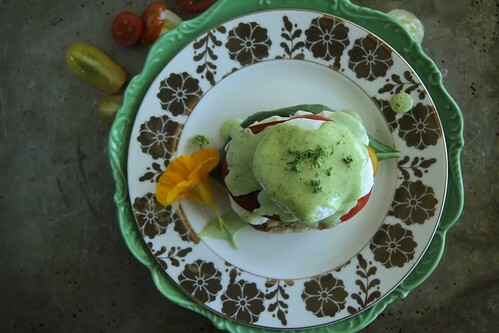 Crispy English muffins, fresh mozzarella, basil and juicy heirloom tomatoes were topped with poached eggs and a lemony, buttery, basil flecked hollandaise and it was an amazing combination. There is nothing like a big plate of eggs benedict, some fresh fruit and lots of hot coffee to take the edge off a little hangover, wink, wink… But I actually think that this would be great for dinner too. Put a shallow pot of water over medium heat to simmer and add the vinegar. 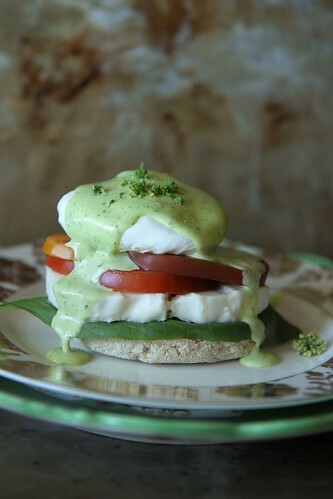 While the water is simmering, make the Basil Hollandaise Sauce: Combine all of the ingredients in the blender and puree until very smooth. Season to taste with salt and pepper and set aside. Toast the English muffins until crispy and top them with the mozzarella, tomatoes and basil. Poach the eggs by swirling the simmering water hard with a spoon and then gently crack an egg into the center of the swirling water. Cook until the egg is half cooked through, but still runny in the center, about 3 minutes. Drain gently and top the benedict with the egg. Spoon the Basil Hollandaise over the egg. Serve hot. Eggs Benedict is the PERFECT hangover breakfast! This looks like a gorgeous twist. This is perfect!! Holy yum! Eggs and basil make everything better. Oh and the cheese helps too. Obviously! I’m obsessed wit caprese things too and this recipe looks awesome!! This is genius and SO gorgeous, Heather! Absolutely love it! The basil hollandaise sounds amazing. What else can I put that on? Funny you should ask Beth- I went and made like a carboanara (which I will post tomorrow!) afterwards because the sauce SO FREAKING GOOD!!! What a fabulous idea! This just looks amazing. I am pretty much turning into a Heather Cristo superfan. All your recipes are just so beautiful and perfect! This is gorgeous. And looks delicious. I cant wait to try it! Oh my goodness Heather, what a breakfast!!! Oh thank you Julie!!! It’s also the easiest short cut hollandaise sauce ever! Ooooohhhh…..I can’t wait to cook this up for brunch this weekend! Gorgeous! I love the basil hollandaise. This is so awesome! 10:45 pm sounds like a good time to have this too… Your post is making me SO hungry! 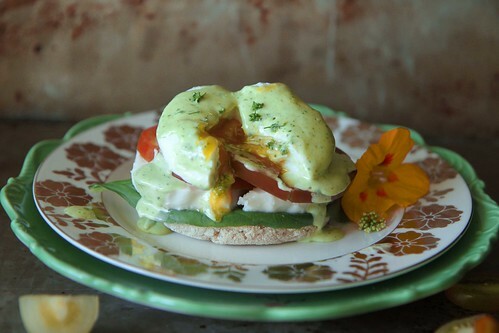 Oh that green hollandaise got me! What a gorgeous dish! This is pretty freaking genius! Love the idea of basil in this dish – this looks amazing! Oh my god. I can’t even handle all of this deliciousness. And is it just me or does the sauce on top look like a heart? Perfect because I’m pretty sure I will LOVE this. No that I look, the little parsley flowers do make it look like a heart!! thx D!! AMAZING! Made this for breakfast this morning and it was absolutely stunning. Two of my favorites in one dish!! You, my dear, are brilliant. Superb! thank you so much Stephanie- so glad that you enjoyed it!